In a self-organizing particle system, an abstraction of programmable matter, simple computational elements called particles with limited memory and communication self-organize to solve system-wide problems of movement, coordination, and configuration. In this paper, we consider stochastic, distributed, local, asynchronous algorithms for “shortcut bridging,” in which particles self-assemble bridges over gaps that simultaneously balance minimizing the length and cost of the bridge. Army ants of the genus Eticon have been observed exhibiting a similar behavior in their foraging trails, dynamically adjusting their bridges to satisfy an efficiency tradeoff using local interactions . 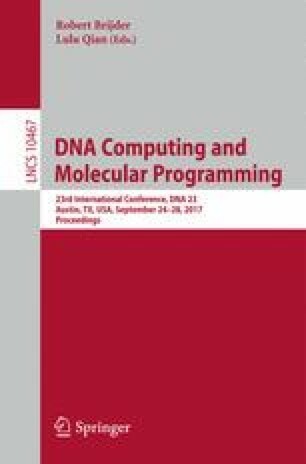 Using techniques from Markov chain analysis, we rigorously analyze our algorithm, show it achieves a near-optimal balance between the competing factors of path length and bridge cost, and prove that it exhibits a dependence on the angle of the gap being “shortcut” similar to that of the ant bridges. We also present simulation results that qualitatively compare our algorithm with the army ant bridging behavior. The proposed algorithm demonstrates the robustness of the stochastic approach to algorithms for programmable matter, as it is a surprisingly simple generalization of a stochastic algorithm for compression . S. Cannon—Supported in part by NSF DGE-1148903 and a grant from the Simons Foundation (#361047). J.J. Daymude—Supported in part by NSF CCF-1637393. D. Randall—Supported in part by NSF CCF-1637031 and CCF-1526900. A.W. Richa—Supported in part by NSF CCF-1637393 and CCF-1422603.